Like many of the jobs I suggest, Mat is like “no, that is unnecessary, you can fund that job” well the living room floor was one of these. But also like most jobs, he says no, the next thing he is well involved. This was no different, two weeks after leaving me to go solo on this project, he was helping me bring in the packs of wood and I had decided to also get enough to cover the hallway. Which I had already hired a professional sander and then varnished a few months prior. 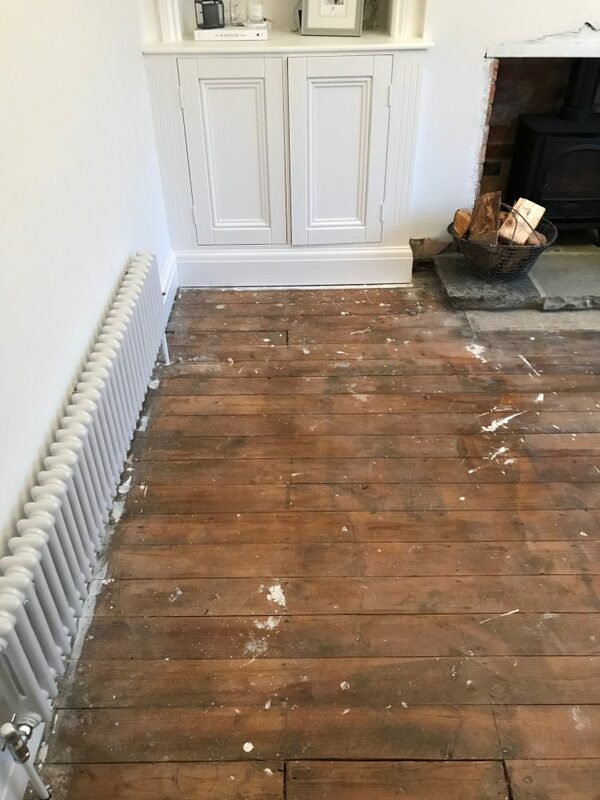 As the original floorboards in our living room had been cut up quite a lot for plumbing and during the re-wire etc, therefore, we knew we would have to do something. And I thought if we are going to have to replace a lot of the flooring, why not create another job on our long list and replace the entire flooring; which I am so glad I did. 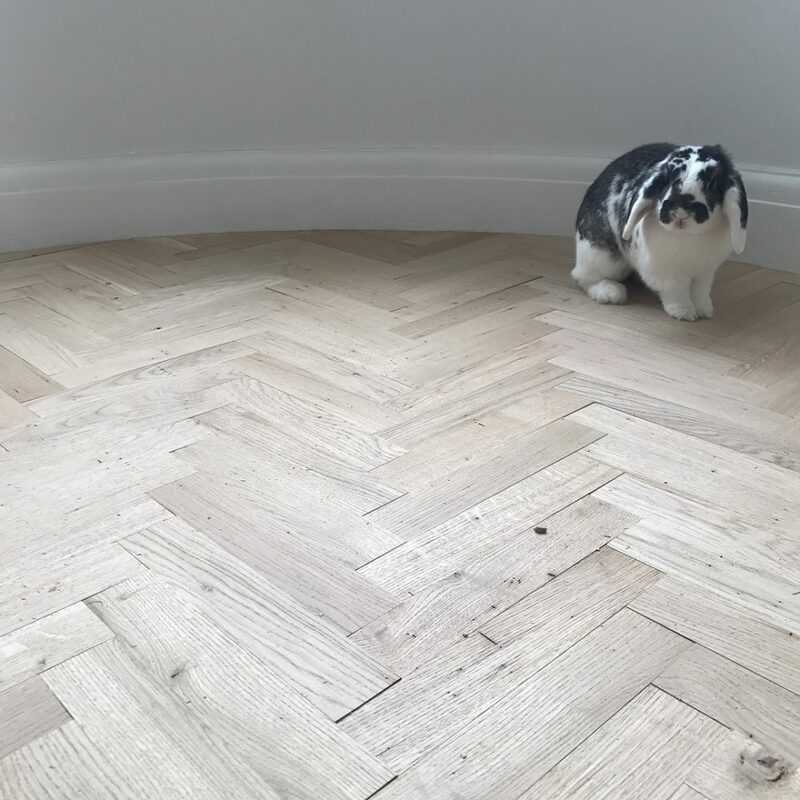 As I frequently get asked about the flooring I have tried to answer all those queries for anyone looking to do this. 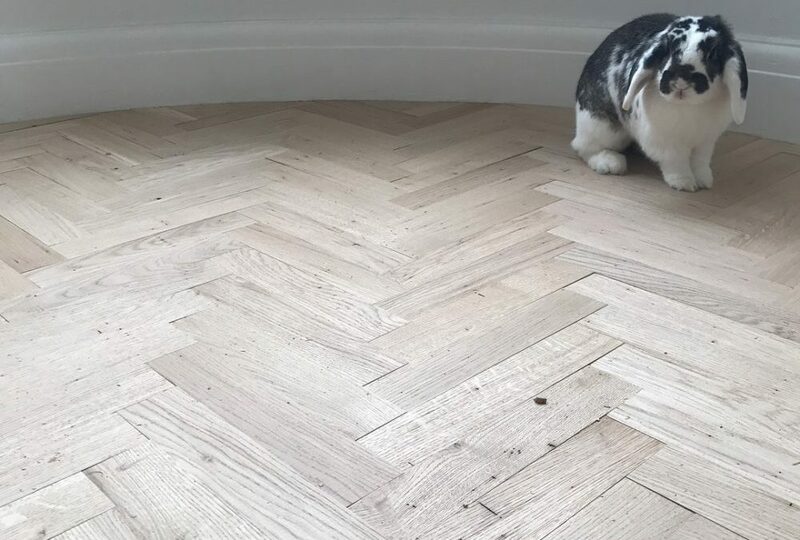 I always thought parquet and herringbone flooring was the same thing, but to help when searching parquet is just the size of the wood mosaic used and herringbone is a pattern in which it can be laid, but there are various ways parquet flooring can be laid. 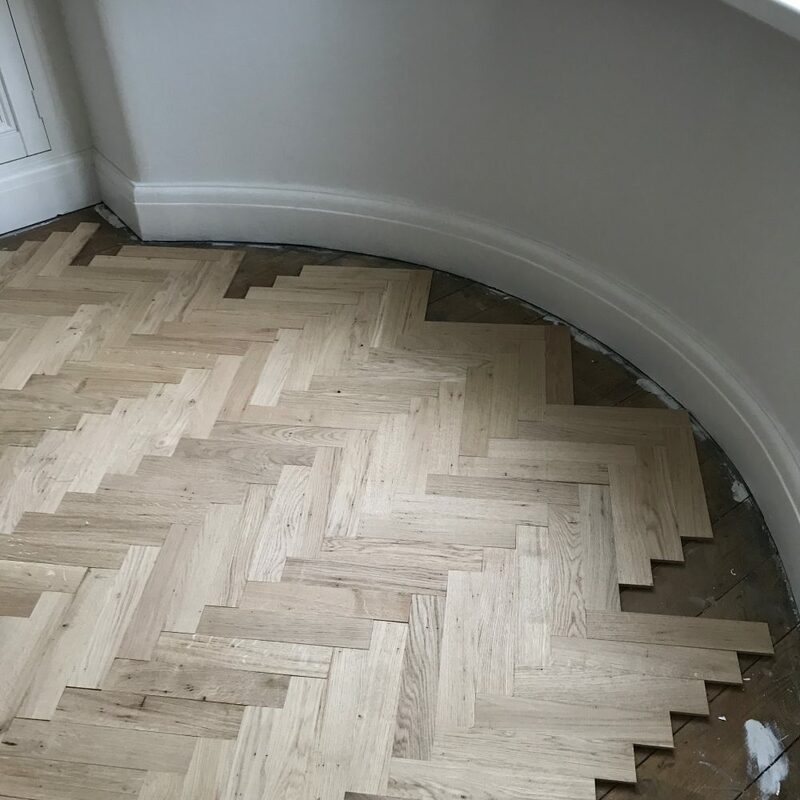 We went for herringbone, but Pinterest will provide a number of ways it can be done and also how the edging around the room can be done. As we have a bay window and a lot of intricate details around the two rooms. 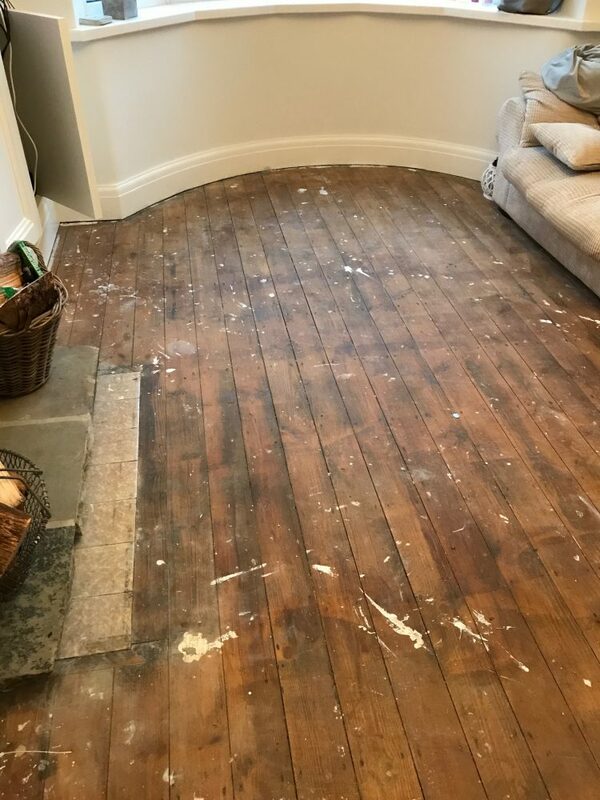 That and I decided to do this after the skirting had been done, therefore, the flooring would go up to the skirting, opposed to the skirting sitting on top. I wasn’t sure how a border would look, especially in the bay, and so I decided to go against bordering and let the pattern run into the skirting. As you can imagine there are some many options in terms of length and thickness. As our living room isn’t that big and I was conscious of avoiding it looking smaller, therefore, I wanted something quite thin and long which I felt would work best for our space. Which is when I found what was perfect, with a 60mm width, 300mm length and 10mm thickness and after ordering samples. 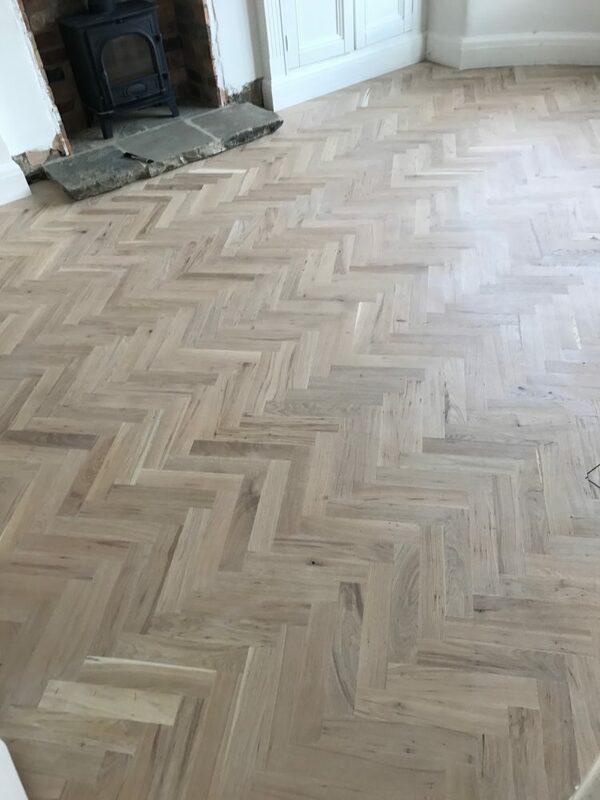 We went for the unfinished solid oak blocks which cost £20 per metre squared including VAT, from direct wood flooring. Having done a lot of google searching. I found this to be a really good price and I actually think at the time I found a 10% off discount code, so always worth seeing if they have any active codes..! I am more than happy to sand and paint the entire house, as you may have noticed, but I know my boundaries. Therefore, we arranged for the carpenter we use, the main man Shaun, to come and lay the flooring. Who is more of a perfectionist than me, the poor sod even took it all up after doing 4 rows as he wasn’t happy! I have had a few people ask how much this cost for us to do, but obviously this depends on the size of the room etc. For those who are interested and wanting to do the same I have given a breakdown below which may help you work out for your own job and obviously labour will depend on what the day rate is. Alternatively, some carpenters charge for the job, opposed to day rate. 5 days sanding as this required using varied grits to get a smooth finish. 1 day (half day for each coat of treatex) which we left 48 hours between the treatex spruce and the clear coat. 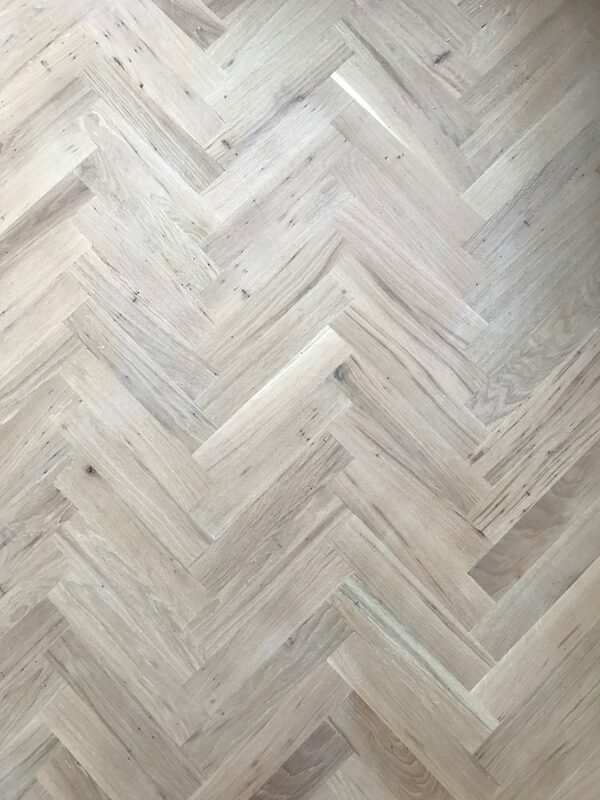 When planning the living room I wanted it all light walls and therefore, thought dark oak herringbone would look gorgeous. 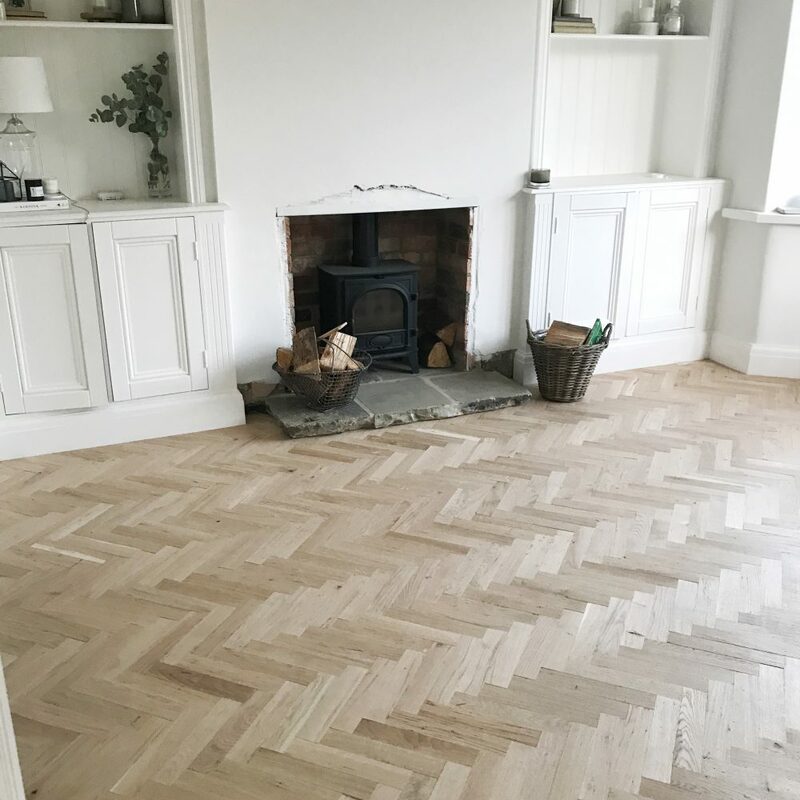 However, once the flooring was laid I really loved it and didn’t want to lose all the character in the wood so I couldn’t bring myself to stain it. 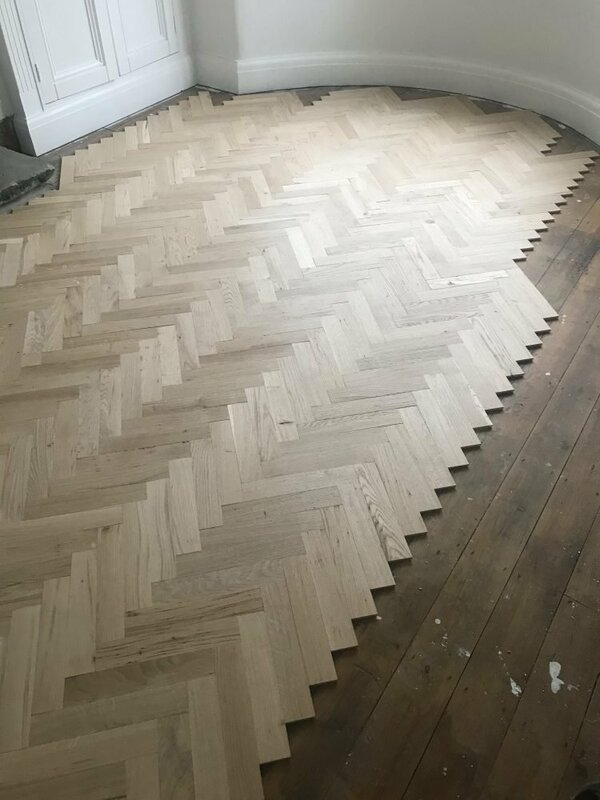 Also as we had this laid in the living room leading through to the hall I wanted to keep the hallway as light as possible and wanted it to flow through and not be different stains. 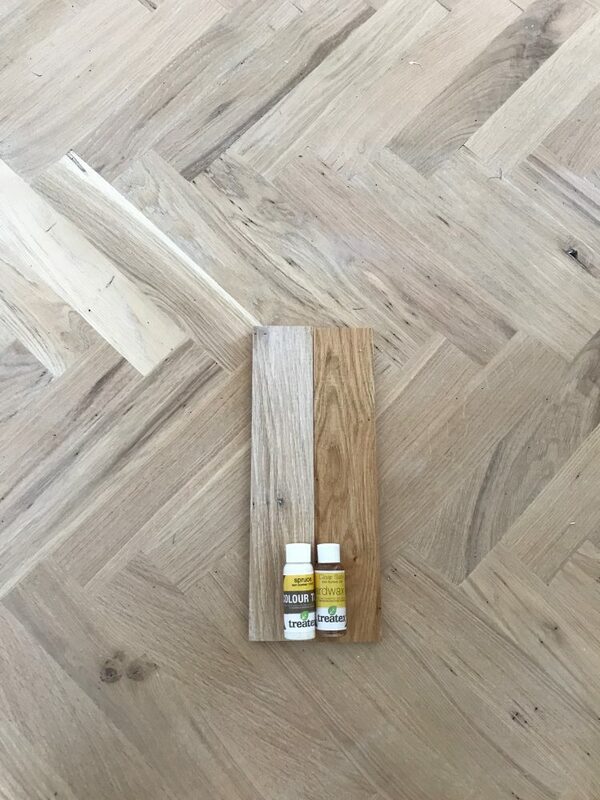 As soon as you oil any unfinished wood though, it automatically will become darker, sometimes i find it can have a bit of an orange undertone. I wanted to keep as much of the natural grain of the wood, but with a slight white wash look to it. As white as my other half the white paint police would allow anyway! 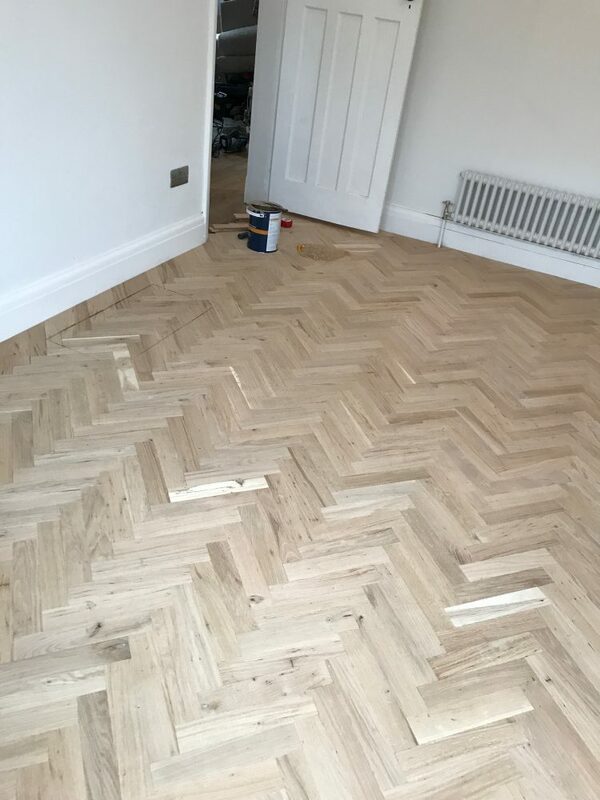 To get this look I went for the ‘Treatex Hardwax Oil Colour Tone 11070 – Spruce’ which we then protected with ‘Treatex Hardwax Oil Clear – satin’ I accidently picked up Satin not Matt, but we don’t talk about that. Although, the satin, isn’t glossy at all, it just looks slightly shiny when the light hits it. This isn’t the cheapest oil you could probably find, each 5L tin it cost £65. But for what we want and in comparison, quality wise I would definitely recommend. I think you can buy this online from amazon, but I went to our local decorating centre as I picked up a few samples. If you want to do this, you can just type on your postcode to find your local stockist – Treatex Stockists. There are other options like Osmo Oil (which is similarly priced) we used this for the kitchen and has some great shade options. Again, this just depends on what finish you want as to which may be best for you and I am sure there will be lots more alternatives available. As you have laid this directly onto your floorboards have you founds its moved at all? 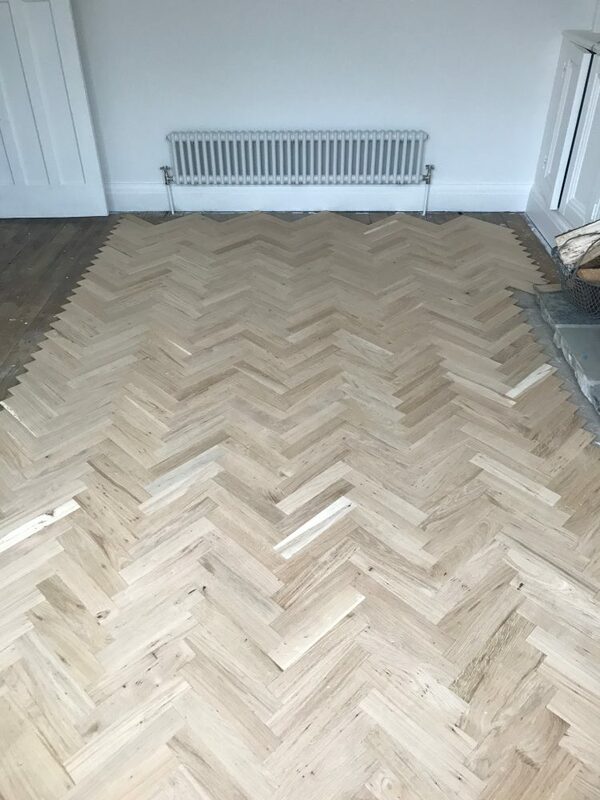 I am looking at installing a similar floor but am concerned I may need a layer of ply underneath to stop movement and make sure everything is completely level? Your living room is gorgeous! Hi there – great post. 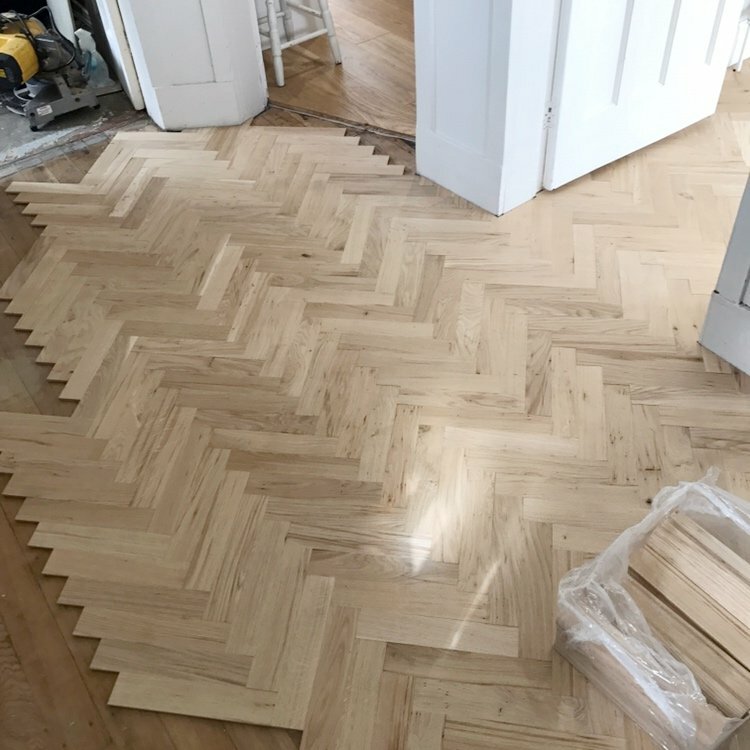 I’m looking at ordering a very similar block style floor and have seen advice that suggests putting down a plyboard base is best practice. I would like to put them directly onto the floorboards as you have. Have they been ok since laying them?! Thanks in advance.